The end of Persian wheel. When I wrote about Persian wheel recently, the headline carried a question mark. That’s because the wheel was still turning somewhere, keeping a fiction of hope alive. 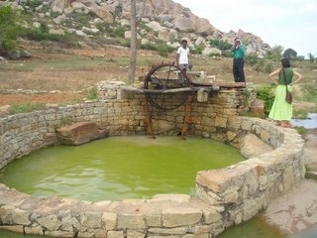 That the last surviving Persian wheel in Kolar in Karnataka would somehow clatter along. That it would somehow continue to draw water slowly while leaving the groundwater table unharmed. That it would continue to remind us that the secret of a water-secure future lies a simple realisation that we have to respect the bountiful Mother Earth as much as we enjoy her generosity.But this time, it’s a full stop. 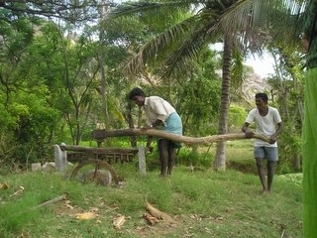 Because the last surviving Persian wheel in Kolar is no more. A 2000-year-long, beautiful journey—that perhaps began with raising water from the Indus, moistening the crusted earth along the Nile—came to an end in Karnataka when the Kolar farmers surrendered themselves to the pull of electric pumps. S Vishwanath of Rainwater Club, who had been tracking the journey of this heritage, officially confirmed its demise recently. So, no more can we see a chain of buckets slung around the Persian wheel judiciously lifting water from wells as deep as 12 metres. No more can we hear the symphony of the constant clattering of the wheel, the rhythmic movement of the oxen in endless circles, the water running down a stream and flowing crisscrossed along the ploughed burrows of paddy fields—something that happened in the blissful absence of anything power-driven! It’s now the same sordid tale of the ever-thirsty electric and diesel pumps sucking up water in obscene quantities and rendering open wells dry. Why can’t we, for once, understand that digging deeper does not always make sense? 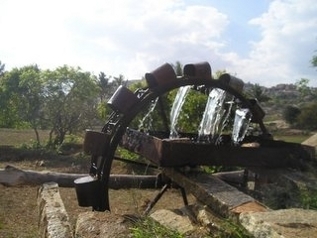 This entry was posted in Endlessly Green and tagged Borewells, Earth, groundwater table depletion, Indus River, Karnataka, Kolara, Nile, Persian Gulf, Water, Water table, Water wheel. Bookmark the permalink.